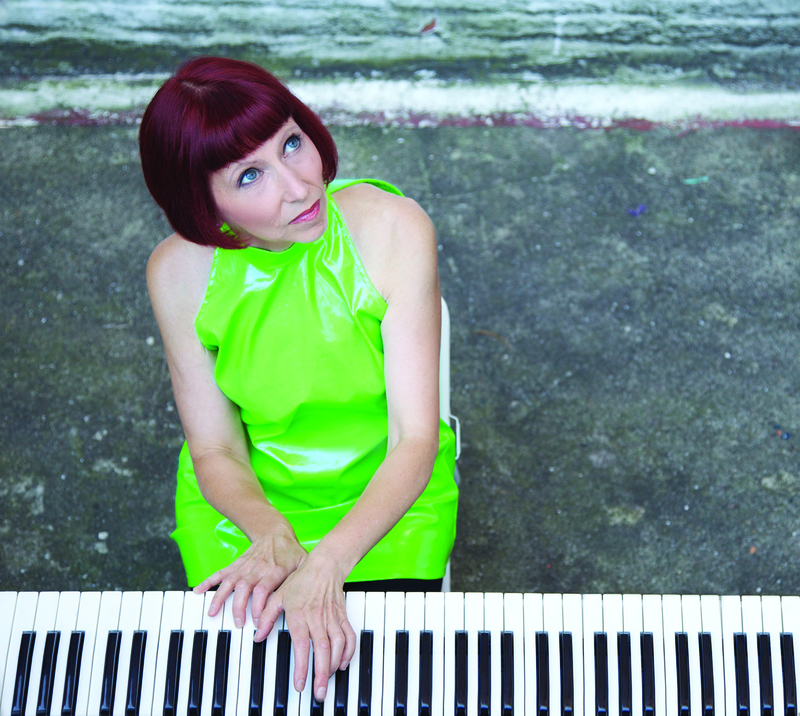 Kathleen Supové is one of America’s most acclaimed and versatile contemporary music pianists, known for continually redefining what it means to be a pianist/keyboardist/performance artist in today’s world. In addition to her compelling virtuosity, she is also known for her inventive ways of breaking down the wall between performer and audience. After winning top prizes in the Gaudeamus International Competition for Interpretation of Contemporary Music, she began her career as a guest artist at the prestigious Darmstadt Festival in Germany. Since then, Ms. Supové has presented solo concerts entitled The Exploding Piano, in which she has championed the music of countless contemporary composers. Among these are: Frederic Rzewski, Louis Andriessen, Terry Riley (including the all-star historic performance of “In C” in Carnegie Hall, curated by the Kronos Quartet, with the composer performing), Earle Brown, Chinary Ung, Giacinto Scelsi, Iannis Xenakis, John Adams, Morton Subotnick, Joan La Barbara, Jacob TV (Ter Veldhuis), Alvin Curran, Randall Woolf, Neil Rolnick, David Lang, Nick Didkovsky, Eve Beglarian, Missy Mazzoli, Mohammed Fairouz, Anna Clyne, Daniel Bernard Roumain, Gene Pritsker, Miya Masaoka, Orlando Jacinto Garcia, Alex Weiser, Dylan Mattingly, Corey Dargel, John Zorn, Carolyn Yarnell, Gene Pritsker, Paula Matthusen, Annie Gosfield, Daniel Felsenfeld, Jacob Cooper, Matt Marks, Marita Bolles, Phil Kline, Lukas Ligeti, Marti Epstein, Arlene Sierra, Patrick Grant, Michael Gatonska, Dan Becker, Elaine Kaplinsky, Dafna Naphtali, Jed Distler, Belinda Reynolds, Isaac Schankler, Gameboy composer Bubblyfish, and many others. WOMEN COMPOSERS, new works by today’s most exciting women composers. Solo works by Alexandra Du Bois, Nina C. Young, Vera Ivanova, Milica Paranosic, Paula Matthusen, Miya Masaoka, and Whitney George, and others; duo works for Anti-Depressant (with Jennifer Choi, violin) by Missy Mazzoli, Augusta Read Thomas, Aleksandra Vrebalov, Susie Ibarra, and others. Exploding Piano concerts have original monologues and theatrical sketches surrounding the pieces. Kathleen, a Yamaha Artist, is working on a long-term project of commissioning a body of works for Yamaha Disklavier. She has played with balloons, ping pong balls, and other objects inside the piano, and has performed with Sideband, the laptop orchestra from Princeton University. She has appeared with The Lincoln Center Festival, The Philip Glass Ensemble, Bang On a Can Marathon, Southbank Centre in London, performance spaces at universities such as Stanford, New College, Cal State Fullerton, and at many other venues, ranging from concert halls such as Carnegie, to theatrical spaces such as The Flea Theater and HERE Arts Center, to clubs such as Le Poisson Rouge. She has been an artist-in-residence and music curator at The Flea Theater in NYC, where many Exploding Piano concerts received their theatrical production premieres. She has been a featured performer at a number of important festivals, including The Ussachevsky Memorial Festival (Pomona College, Claremont, CA); the NIME Festival (New Interfaces for Musical Expression) in New York City; the Approximation Festival (Düsseldorf, Germany); Club Contemporary Classical (Berlin, Germany); the International Keyboard Institute and Festival (Mannes College The New School for Music), and the SEAMUS Conference (Wesleyan University, CT). Other recordings can be found on the Koch International (now eOne), Major Who, Tzadik, CRI, Innova, New World, Neuma, Bridge, Centaur, OO, and XI labels. Besides being a soloist, Kathleen is keyboardist of the art-rock band of Nick Didkovsky, Dr. Nerve; she also has duo collaborations with violinist Jennifer Choi (Anti-Depressant), guitarist James Moore (A Musical Sacrifice), and oboist Keve Wilson. For more info, visit www.supove.com or follow on Facebook or Twitter (@supove). Kathleen Supové is one of America’s most acclaimed and versatile contemporary music pianists, known for continually redefining what a pianist/keyboardist/performance artist is, in today’s world. Ms. Supové annually presents a series of solo concerts entitled THE EXPLODING PIANO. In this series, she has performed and premiered works by a list of established and emerging composers that’s a Who’s Who of contemporary music for piano. She has especially championed music of compelling virtuosity and audience connection. The Exploding Piano is a multimedia experience using electronics, theatrical elements, vocal rants, staging, and collaboration with artists from other disciplines. Through her composer collaborations, she has become an integral part of creating a repertory of piano pieces for the modern world. Recent projects include THE DEBUSSY EFFECT, on New Focus Recordings (La Barbara-Clark-Marks-Felsenfeld-Woolf-Gosfield-Cooper); a performance at Southbank Centre, London, of URBAN BIRDS by Arlene Sierra as part of Britain’s New Music Biennial; BATTERY, a choreographed kickboxing concerto by Randall Woolf (choreographed by Heidi Latsky; EYE TO IVORY, an upcoming CD on Starkland, for vocalizing, theatrical, extended technique pianist, on Starkland (Childs-Woolf-Barash-Didkovsky-Naphtali); EXPLODING PIANO WITH HITCHCOCK AND KUBRICK ETUDES by Nicole Lizée; and many others. Kathleen Supové is a Yamaha Artist. She performs in a wide variety of spaces, from concert halls, to theaters, to universities, to alternative galleries and clubs. Ms. Supové is also the keyboard player for the art-rock band, Dr. Nerve, and she has duo collaborations with violinist Jennifer Choi (Anti-Depressant), guitarist James Moore (A Musical Sacrifice), and oboist Keve Wilson. For more info, visit www.supove.com or follow on Facebook or Twitter (@supove). In May 2012, Kathleen Supové received the John Cage Award from ASCAP for “the artistry and passion with which she performs, commissions, records, and champions the music of our time.” Kathleen Supové is one of America’s most acclaimed and versatile new music pianists, continually redefining the pianist/keyboardist/performance artist in today’s world. Ms. Supové presents solo concerts under the moniker THE EXPLODING PIANO. A striking presence onstage, she has performed with computers, boxing gloves, robots, and laptop orchestra. Recent projects include two solo CDs: THE DEBUSSY EFFECT, on New Focus Recordings (La Barbara-Clark-Marks-Felsenfeld-Woolf-Gosfield-Cooper), the result of a multi-composer commissioning project; and EYE TO IVORY, (Childs-Woolf-Barash-Didkovsky-Naphtali), with vocalizing, extended techniques, Yamaha Disklavier, and noise-based effects, to be released on Starkland in 2018. Visit www.supove.com or follow on Facebook.